Towards the west of the hill country is the scenic village of Kithulgala. The landscape here is particularly dramatic with vegetations. Forest clad cliffs plummeting down to the wild waters of the Kelani river. 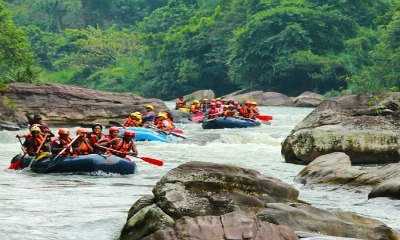 This is also the site of some of the best white water rafting in Sri Lanka with grade three rapids some 5km up stream. Kithulgalas' other clams to fame is the site for the filming on the 1957 academy won film, "The bridge on the river Kwai."